Pros: I have a home server that I recently upgraded from a Celeron to a low power i5-4590S CPU. I used the stock Intel cooler but I was seeing idle temperature in the 40's and maximum temperatures during heavy CPU usage hitting low 90's (Celsius). My server doubles as an HTPC in a theater room so I required something cooler, something quieter. 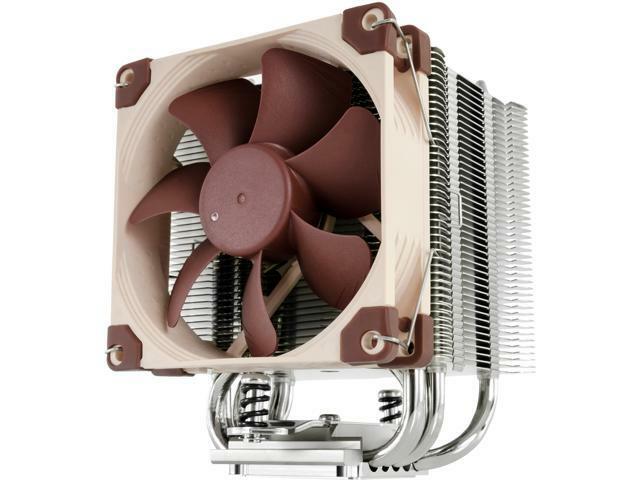 It's common knowledge that Noctua makes some high quality, high performing, and very quiet cooling solutions. I've used Noctua fans in the past but never ponied up the money for one of their heatsinks until now. My server case (Fractal Design Node 605) is height limited. A larger cooler will not fit and smaller coolers don't perform well or are too noisy if they do. This heatsink fit perfectly into my limited space server case. In my situation, the NH-U9S dropped my server/HTPC CPU idle temperatures but more importantly a Prime95 burn test maxes out the CPU at 67 °C. That is 25 °C lower than what I was getting with the stock Intel cooler. Better still, I cannot hear anything from this cooler even during the Prime95 burn testing. Cons: There isn't a single nit to pick about this cooler. It is small, it is quiet, it performs. I like the brown and beige. It's like Noctua goes out of their way to prove function over form when many other products out there have it backwards. Other Thoughts: Noctua products just ooze quality. There's a solid feel to every product they make and you get the impression that a lot of engineering and thought goes into their products. They have the best packaging, the best accessories... the best products. The contact plate on the bottom of this cooler was perfectly flat and the most polished example I've ever seen on a cooler. They even included a whole tube of their premium thermal paste. With other coolers, you're lucky to get a small sachet of low quality grease. Pros: - Runs *very* cool. I was somewhat concerned that the single 92 mm fan would be noticeably worse in performance. I was wrong. - Runs *very* quiet. Even on max speed (~1900 RPM) and with open vents on the top of my case, this thing is whisper-quiet. Cons: - The screwdriver cutout to install the radiator is kind of small. As a result, it was a little difficult to get a good angle for installation. But it ended up being just a minor inconvenience, as it installed fine. - Personally, I would much rather have a black or dark gray fan, but w/e. It's a unique look and the quality is worth sacrificing that preference. Other Thoughts: - I installed this into a Corsair 100R case. Fits great with a healthy cushion of headroom between the radiator and the side panel. - My kit came with the hardware for installing on an AM4 socket. Other Thoughts: this cooler is amazing for how much it cools vs how quiet it is. before with the stock cooler that came with my i5 8400 i was getting 40-50c idle and 70-80 load (gaming) now i get 30c idle and 50c load all wile running two 92mm fans push/pull at 55%. this was a temporary solution untell i could save up for a custom loop. but im so satisfied with this product I might get a custom Loop for a few years. Cons: Taking the cooler out of the box I found four fins bent down. I had to use a finger nail to pick them up with different problems yet to come afterwards. At the bottom of the bar that runs across the cooler base, it has two screws that is used to attach the cooler to the motherboard. I don't know if it's a defect but on the shorter end of the bar, the screw attached is somewhat too far underneath the cooler causing issues for the screwdriver to fully attach to it evenly on the head. Not knowing, if you start to screw down the second screw on the long side of the bar first, this causes the other screw to bend in more causing pressure on the IHS of the CPU and the result from this, the bottom of base now has scratches in a square shape the size of the IHS. I had a different Noctua cooler in the past and never experienced these things. Other Thoughts: I paid next business day shipping not including the tax. I'm going to have to fight Newegg to try and get this part of money returned for a defective item Noctua sent me. If restocking fees is mentioned to me, I'll go viral. 1 out of 14 people found this review helpful. Did you? Pros: It does a good job cooling my i9 9900k in an NCase M1 SFF Build (Idle: 39-43C and Load: 88C). This is with a second 92mm NF-A9 fan added. This is all in a generally warm Caribbean climate of 25-31C ambient room tempearature. Other Thoughts: Good product overall as always from Noctua. Put this in Antec p5 case on AMD 2600x chip. Ordered adapter kit but found that they are starting to ship these with AM4 support included. Temps under high all core load at stock Ghz went from 80-90c with stock cooler to 60-70. This is during sustained video encoding that resource monitor shows running all 12 threads at ~95% consistently. Gaming it stays usually around 60c. Keep in mind that my case isn't very well ventilated either due to sound dampening microatx design. Mounting couldn;t have been easier or safer. The screws are up away from the board and I installed with it still mounted in case with GPU still in place. Nice small form factor option while still getting tower design benefits. I can easily use all RAM slots on MSI b450m Mortar board.